With the premiere of Fantastic Beasts and Where to Find Them only a couple short weeks away, fans old and new to the Potter universe are gearing up their excitement. As this movie opens up the franchise to a different time period and a slew of new characters and magical history and possibilities, we’ve got a whole new world ahead of us. A few new TV spots give us another look at that world before the premiere. But first, as we all know, you can’t be a wizard without a wand, so Merchoid has released images of the prop replica wands held by all the magic-wielding characters in the movie. Each comes in its own little box with its own ribbon, as Potter wands have in the past. Hopefully, for those fans who are really into it, Fantastic Beasts will release more information about what kind of wood the wands are made of, and what magical object they each have on the inside. 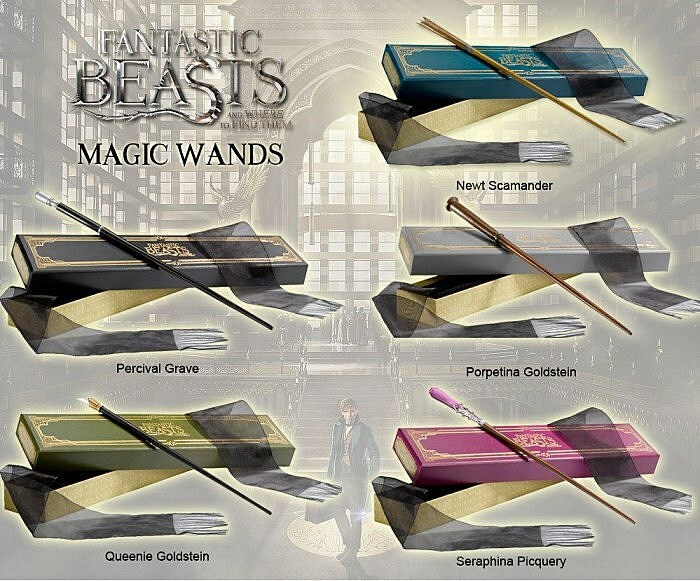 For now, we can see how each wand fits each character’s personality: Seraphina Picquery’s (Carmen Ejogo) cotton candy look in particular stands out, as does Percival Graves’ (Colin Farrell) sinister ebony one. Next, we have a few new TV spots showing us more of the world that Fantastic Beasts will introduce. Most of what’s in them isn’t new, just mostly a rearrangement of footage we’ve already seen, but some hold some additional material, like “Livestock” above, which gives us a few more glimpses of the dazzling special effects used to being the beasts to life. In the other two, time is running out, while a sinister force grows ever closer.